Below are directions and rules for many of the facilities CEVA and Member Clubs use to host events. Each facility has its own rules, so be prepared. An easy rule of thumb - water only in the gym. Violations of the Food & Drink policies can lead to penalties for teams (even if parents or fans are the violators). Not knowing the policy is not an excuse. With over 500 CEVA teams needing gym space, we cannot afford to lose a facility because our players/parents break facility rules. DO NOT CONTACT FACILITIES FOR TOURNAMENT INFORMATION. CEVA DOES NOT COLLECT LOST AND FOUND AFTER TOURNAMENTS. Outside Food Allowed: Please clean up after yourself. No BBQ's/food warmers allowed. Concessions Available (coffee, candy, bagels, chips, bottled beverages, chocolate bars, muffins, etc). Outside food and drink allowed in staging area. No outside chairs allowed in gym. Outside tables with rubber feet are allowed. Use of BGCA tables and chairs by teams is prohibited. Designate staging area allowed for camping. Overflow parking at Linn County United Way, Center Enterprises and Crabtree Automotive. No parking in Church lot. No RV or overnight parking. All parking is free. Outside food and drinks allowed in the lobby. Water ONLY in the gym. No coolers allowed. No tailgating in the parking lot. No spectators upstairs on Saturdays. Two parking lots (front and rear). 204 parking spots total. Outside tables and chairs are allowed, but not recommended. Chairs must have padding. Concessions are available, selling sports drinks, candy, pizza, hot dogs, pretzels, water, etc. No items higher than $4. No coolers in halls or either gym. Cars MAY NOT PARK along the entry driveway. Concessions available. Student Center is available for team camping. Outside food is allowed. Tables in Student Center are okay. Chairs are allowed, and some chairs are available. No bleacher seating available. No electrical appliances (crockpots), no BBQs. No volleyball play except in gym. Overflow parking in the back of the building. No overnight parking allowed. No outside food or drink! Coffee is allowed in lobby area only. Water ONLY on courts. Food carts are typically available outside the facility. Bleachers provided. Outside chairs allowed with approved feet or blanket underneath. No outside tables allowed in the building. No overnight parking. No open flames allowed on the premisis (i.e. BBQs). Courts are in the High School, which is the newest building on campus. Outside food & drink is allowed in designated camp areas only. Water only in gyms. No appliances allowed. Tables & chairs allowed in designated camp areas only. Concessions are available, open from 7:30 to 4:30. No pets allowed on campus. Commons area outside the gym for food and drink, outside food allowed. Teams must clean up their camping areas. No gas or electronic cooking devices allowed inside the building. Spills and messes need to be cleaned up by the family/player/team. Ample bleacher seating is available. Outside chairs are allowed in limited areas. Ample on-site parking. Lost & Found: Please contact CEVA office after the event. Please contact CEVA with any additional facility related questions for this site. Parking available in the Orange Lot and gym is in Building 7. Do not park in the fire station parking lot. No BBQ, crockpots, electrical outlets to be used. No pop-up tents or food tables outside. Outside chairs on the back court are okay, however other 3 courts have bleachers. No ball handing outside of the gym. The site will have a designated camp area for each team, which teams will be asked to stay within. For further information speak with onsite tournament director or facility hosts. Commons area outside the gym for food and drink, outside food allowed. Teams must clean up thier camping areas. No gas or electronic cooking devices allowed inside the building. Outside chairs and tables are allowed. No overnight parking. Please park in the east parking lot by the gym. Outside food is allowed in the commons area. No food in the gym. Concession stand will be open with drinks, snacks, and pizza. No appliances - BBQs, Crockpots, etc. Located at the intersection of Granger & Hwy 99. No RV parking available. Personal chairs allowed and recommended. Must have a blanket or rubber bottoms to protect the floor. Parking is limited - please do not park in CrossFit marked spots (lower lot) or at the gas station. Cars parked at the gas station (Texaco) will be towed. Parking lot is adjacent to gym/field, street parking is also available. RVs are okay, but no overnight camping. No outside chairs. Water Only in the gym. Cafeteria is available for team areas. Please clean up your area at the end of the day. Concessions MAY also be available. Bleacher seating is provided and tables will be available in the cafeteria. Coolers are okay, but no crockpots or BBQs. Outside chairs are allowed if they have rubber soles. Entry off side street of Jackson St.
Outside food allowed in designated areas. Upstairs gym is available for team areas and food/drink. Plenty of bleacher seating available. Outside chairs allowed. No camping on carpeted areas or hallways. No food on carpeted areas. Cafeteria will be open with tables. No concessions available. Food & Drink allowed in the foyer area - water only in the gym. Coolers are ok in the building - no crockpots or BBQs or other appliances. Outside chairs allowed - no bleacher seating provided. Parking: Access of 20th Ave, go through Lot I to park in Lot J. Water ONLY in the Gym. Outside food allowed in team areas only. Coolers and tables are not allowed inside the facility (must stay outside). On-site concessions available. Food must stay in team areas (not in gym). No outside chairs allowed - bleachers are available. Water ONLY in the Gym. Food must stay in team areas. Outside food allowed in Cafeteria/Commons area only. Full bleacher seating provided. No outside chairs allowed. Facility Address: 2440 Lancaster DR. NE. Is RV Parking Allowed? RV's will be OK during the day but no overnight stay. If people need to stay overnight there is a Walmart 1/4 mile away that allows RV's to stay in there parking lot overnight. No food in the gyms, Water ONLY allowed. Outside food & drink is allowed in teams area only. Concessions available. No grills, crockpots or electric appliances allowed. Use the school parking lots (avoid parking on streets) in order to allow for emergency vehicles and neighborhood traffic. Do not park in the church parking lot across the street from the school. Parking around High School is ample. Food in common area OK.
A table is provided for each team in the cafeteria area. Some bench seating in the gym area for spectators. Bringing lawn chairs is acceptable. Outside tables allowed? No outside tables allowed in the facility. Outside food allowed? No outside food allowed in the facility. Electrical appliances allowed? No electrical appliances allowed in the facility. Food purchased at the concessions stands can be taking into the spectator seating area. Doorways must be kept clear and unobstructed. Water Only in Gym. Outside food allowed in common areas. Outside food, drink & coolers allowed in common area. No crock pots, electrical items or grills (gas, propane, charcoal) on school property. Outside chairs permitted with blanket or floor protection. Facility will also have chairs set up for spectators. Tables provided in student commons area. Outside tables also allowed. Enter parking lot on the east side of the school, and drive around to the north end. Door to the gym is on the north side of the building. Use main entrance and tell front desk you are there for volleyball. Concession available. Bleachers are provided. Teams may set up tents outside in the foyer. No coolers or tables are allowed in the gym, however food will be allowed in designated team areas. Gate: $5 per person, $3 students, Kids under 5 free. Note - for March Power Leagues at North Marion, Court 4 will be in North Marion Middle School - directly across the street from the High School. No Food or Drink in the Gym. Water Only. Outside food allowed in commons area. Parking fees not enforced on weekends. No concessions are available, however outside food and outside tables allowed in the commons. Coolers, crockpots, and BBQs are allowed in the commons. Chairs allowed in the gym with towel/blanket underneath. No parking restrictions - RVs are okay. School is located behind the Academy Square Mall off Lancaster Drive. After entering the mall parking lot, look for driveways to the school on either the north or south end of the parking lot. Concessions are available in the main gym cafeteria area. Parking is available on the north and south sides of the school property. No overnight parking (RV's, campers, etc). Outside food is allowed in the cafeteria area only. No food will be allowed in the bleachers of either gym - water and coffee only. Water ONLY in Gym. No Food in Gym. Bleacher seating available. No outside chairs allowed. No food or drink allowed in gyms. NO alcohol or tobacco allowed anywhere on school property. Coolers in hallways only. No electical appliances allowed. No outside tables or chairs. Do not park in Tualatin Hills Parks and Rec. parking lots. They will tow. Note: do NOT turn right on Croisan Scenic Way (some GPS apps advise this). Continue past this road approximately 1/4 mile and turn right at the traffic light at Joseph Road. You will see a park on the right with baseball/softball fields - this is the main entrance to the school. No food in the gyms - food in team area only. Outside food & drink is allowed in team areas. Outside chairs with padding allowed in gyms (and recommended). Please do not sit on the sides of the courts in playable area. Move your chairs from ends of courts when your team isn't playing. Outside tables allowed in team areas only. RVs allowed in lower parking lot by football field. Plenty of parking available around the school. Concessions may or may not be available at the facility. Players and parents/fans are advised to bring their own food for tournaments in case facility's concessions are not available. Concessions will be available. Food allowed in the lobby/team areas only. No food or drinks in the gym (except water). No outside food or beverages are permitted anywhere inside the facility, including snacks/food from home, coffee, sports, drinks, etc. Water bottles only on the courts. CEVA's point penalty policy for violations will be enforced. Outside chairs must have rubber feet or a blanket underneath. No metal bottoms on chairs. Bleachers are also available. No pets (including dogs, cats, etc). Service animals with ID jackets are welcome. Teams and spectators may not set up "camp" in the parking lots or grass areas. This includes tables, chairs, tents, canopies, etc. No grills or other means of heating food may be used on the property. PARKING: Please note you may be towed if parked outside the designated areas. Click Here for the detailed map of available parking. Overflow parking available at the Max Park & Ride. No RV parking or overnight parking in the complex. No kids allowed at adult tourneys without "quality supervision." Quality supervision meaning that someone must be watching over and in direct contact with all children. If a child is found not supervised, the player and child will be asked to leave the facility immediately. This also means that a child sitting on the bench with a player that is not in the game, this is not supervised. For a complete list of Facility Policies click here. No Outside Food Allowed. Refillable Water bottles ONLY (no bottled waters). Specialty coffee is ok. Water only on team benches. On-site cafe, food purchased at The Hoop may be consumed anywhere in the gym. Outside chairs allowed. No outside tables allowed. No BBQ's, electronic appliances or coolers allowed. Additional large space in the back for parking. Do NOT park in the Pringle Creek Community. RV parking is allowed in the South parking lot, only! There is very limited "camp" space in the facility - please limit your personal belongings. 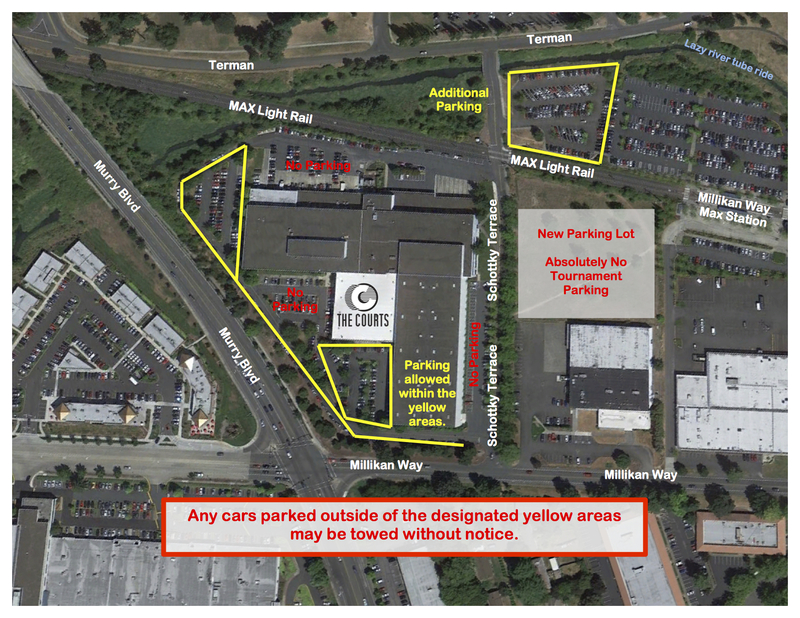 Fairview Business Park where The Hoop is located - Please park in the yellow areas on the map below. No parking in the pink areas. Water ONLY in the gym. No food or drinks in gyms, including coffee. All 4 courts in New PE Building. Concessions with drinks and snacks available. Water only is allowed in the gym. No coolers, electric appliances, BBQs, etc are allowed in the building. "Camping" is allowed in the Lot G parking area or in the grove next to the New PE building. Camp space is not available in the facility. Note - do not use or access equipment that is not specifically marked for spectator or player use, such as chairs. Facility Address: 900 State St.
No food in the gyms - water only. Chairs are allowed on the rubber sidelines in the main gym - no chairs on the hardwood. In the aux gym, chairs allowed if placed on a towel or blanket. Outside tables are not allowed. Outside food and drinks are allowed in the commons area (outside the gym). No electrical appliances are permitted, however coolers are allowed. Teams may "camp" outside the main gym in the commons area, provided they do not block the entrance area or hallways. Parking in front of the gym - RV parking is allowed in the rear and side parking lots. Concessions stand is located outside the main gym. Food, soft drinks, coffee, and other snacks available during open hours. Many nearby restaurants and stores. Rubber-soled chairs are allowed. Tables for food should be limited to one per team. Limited camping area. Spills or messes need to be cleaned up by the player/family/team. No overnight parking and no street parking (you risk a ticket). No BBQs or anything that makes/holds fire. No plugged-in heaters, appliances, or coolers. Please clean up your area - watch for puddles or water due to coolers.